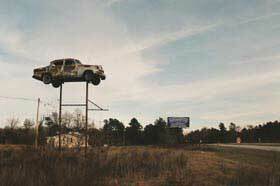 Long before filmmaker Georg Koszulinski verbalizes it in his narration, viewers of his laconic, minimalist documentary A Highway Called 301 will clearly make the same connection he does: The abandoned, weed-overrun structures that lay alongside the titular road resemble the sets of numerous post-apocalyptic movies. Highway 301 stretches from Florida up to Delaware, so, physically, the film goes a little beyond Koszulinksi’s normal Panhandle State confines. Thematically, it fits in snugly with his other social, vaguely political work, like and Cracker Crazy: Invisible Histories of the Sunshine State, Immokalee U.S.A., although this film is much more obtuse and poetical than his traditional style. Actually, in my previous review of Immokalee U.S.A., I called Koszulinski an artist rather than a documentarian. Now, I’m going to call him a poet. Yes, there is the occasional on-screen text poem, but the poetry comes mostly through how the images are arranged that, for the most part, chronicle a dead non-franchised world. The real irony here is just how many abandoned gas stations are photographed. The road is still there, but the fuel that’s needed to drive across it has dried up. It’s funny how decaying, rotting structures can look so beautiful. The muted colors, the blending back into the Earth. These things should be ugly, the remnants of a failed social world, painful reminders that people have lost thing they once owned, pride-fallen. These buildings were filled with happy times when business was booming — and filled with the devastating feelings of failure and loss when that business ended. The world would be a much more beautiful place if this road had never been paved, if these buildings had never been built, right? It’s tough to say. These are our pyramids, our ruins, our Coliseums, our Acropolises. Places fallen by the wayside in the eternal pursuit of the shiny, bright and new. There’s a brief interlude of those new things: the neon, the fast food logos and, most infamously on 301, the spectacularly kitchy South of the Border store. But Kozsulinski never deigns to enter these establishments, his focus is on exteriors — only things that can be seen out of a car window. And it’s through those windows that Koszulinski makes the connection that staring out of driving cars is no different than sitting in a movie theater. Both are fairly passive activities. Even if one is actively driving, one is still just sitting still watching the world pass by just like one would on a movie screen. And that’s exactly what Koszulinski has made here: The cinematic equivalent of sitting like a passenger in a car. Truly, this is a road movie boiled down to its most basic component: The actual road. This is why Koszulinski is a poet and an artist. It’s clear there is something on his mind in his films, but he never spits it out at us directly, which is particularly unique in this film since it features his own narration. He allows the audience to form their own impressions from the preconceptions they have. A Highway Called 301 isn’t exactly a wistful ode to a time gone by. Looking at old backroads in springtime or in the bleakness of a snowy, windswept winter will conjure up different emotions in different people. There are those who will say good riddance to the past, some who will miss a simpler time gone past, those — like myself — who will thank god they will probably never have to drive through a snowstorm ever again and experience warm feelings when they see the opening road shots of George A. Romero’s Night of the Living Dead. Koszulinski takes difficult subjects and presents them in simple, artistic ways. He boils them down to their pure essences and guides viewers through them by way of their own hearts. To make this particular documentary, Koszulinski took a physical journey so we could go on an emotional one. People will travel a world away to view the ruins of ancient civilizations. Why should they? All they need to do is drive across A Highway Called 301.